"Our new challenge for the next fortnight is to find a card or project created by one of the amazing Papertrey Ink DT members and let it inspire you to create something from it". I love to go straight to the Papertrey DT's blogs when I get new stamps and usually have a go at one or two as my jumping off point - I'm sure I am not alone! I didn't have to look far for my inspiration for the first card below as I am a lucky girl and I have the original on my inspiration cork board which Dawn gave to me when I met her and Bartley in London earlier this year. 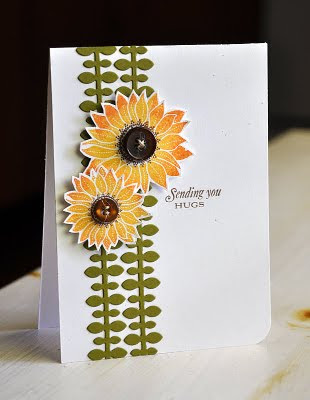 Second off is a case of Maile Bells' lovely Simple Sunflower card. I was attemping to do a rock and roll technique with the inking of the flowers with versacolour chalk ink but it's not too obvious from the photo. When I first got the vine boarder I cut loads of strips with odd bits os card so they came in handy for this card. This is off to Hawaii to a dear and generous friend! Right - cards blogged, family fed, ironing for our holiday finished - it's time to settle down for Downton Abbey - so pleased it is back tonight! Thanks for stopping by and have a lovely week ahead. I'll be back when we get back from our jollies! You did a great job with both cards. How wonderful that you got to meet Dawn and Bartley. Beautiful cards. Wow - you met Dawn and Bartley and she made you a beautiful card. That's amazing.